CrowdStrike Named a Leader in the IDC Marketscape: U.S. Incident Readiness, Response and Resiliency Services 2018 Vendor Assessment. I am proud to announce that CrowdStrike® is positioned as a leader in the IDC MarketScape: U.S. Incident Readiness, Response, and Resiliency 2018 Vendor Assessment – Beyond the Big 5 Consultancies (doc #US44257117, September 2018), which was just published. Our positioning in this important industry assessment is further evidence of CrowdStrike’s commitment to and success at setting a new standard in incident response (IR) and resiliency services. 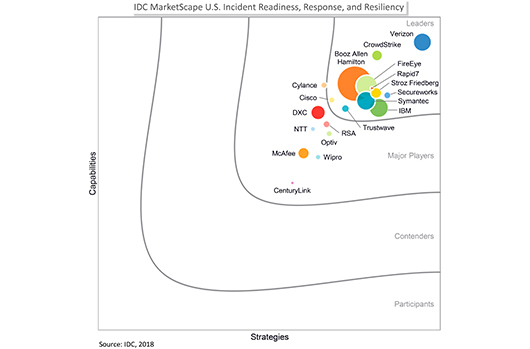 We find this recognition from IDC MarketScape particularly rewarding because its rigorous methodology provides a clear framework for meaningfully comparing the product and service offerings, capabilities and strategies, and current and future market success factors of vendor offerings. The framework also provides technology buyers with a 360-degree assessment of the strengths and weaknesses of current and prospective vendors. Our consistently high NPS score validates not only that CrowdStrike’s methodology and technology are effective, but that the experience and knowledge of our team has been critical in helping organizations when they most need assistance. The CrowdStrike Services team specializes in both proactive services and IR. Proactive services includes a Strategic Advisory offering, providing a full spectrum of tactical and strategic guidance and giving our clients actionable insights and tailored recommendations that can benefit their cybersecurity readiness now and in the future. The intelligence we glean from previous engagements, and our knowledge of cyber adversary behavior, allow us to advise clients on specific strategies they can employ to harden and future-proof their organizations. On the IR side, our investigators go to work in the wake of a security incident, providing a range of assessments that help customers prioritize the infrastructure issues they need to address first. Engagements are customized based on the nature, scope and detail of the incident in question. This helps the Services team pinpoint adversary motivations as well as the TTPs employed, so clients can anticipate future cyber threats and provide attribution where possible. The CrowdStrike Services approach is made possible by combining world-class expertise with powerful next-gen technology. The in-depth knowledge and experience of the Services team members, coupled with the CrowdStrike Falcon® platform, allow us to perform faster remediation and provide actionable insights to not only stop the current attack but prevent future ones by closing security gaps that the client didn’t know were there. In the final analysis, clients continue to depend on CrowdStrike Services and recommend us to their peers because when an organization contacts us, we see their issues as our issues — their fight against the breach is our fight against the adversary. Our approach is always open and helpful — never arrogant — and we are truly invested in our clients’ security, not only during an incident but after. Our customers benefit from the Falcon platform we use in the engagement so that after we wrap up, they have continuity and the confidence they are protected going forward. Our proactive services give them peace of mind, knowing they have the cybersecurity maturity and readiness to face whatever threats are to come. Read an excerpt from the IDC MarketScape: U.S. Incident Readiness, Response, and Resiliency – 2018 Vendor Assessment. Learn how CrowdStrike can help your organization answer its most important security questions. Visit the CrowdStrike Services web page. Shawn Henry, once of the FBI, is now President and CSO of CrowdStrike Services. Henry is credited with boosting the FBI’s computer crime and cybersecurity investigative capabilities. He has been interviewed on “60 Minutes,” “CBS Evening News,” “Good Morning America,” “The Today Show,” “Dateline,” and C-SPAN and by Forbes, BusinessWeek, The Wall Street Journal, the Associated Press and USA Today.